Another mecha question, but this time, at least I think, is not so intense as my last question. I've decided to take my biggest and most ambitious LEGO project yet, a custom MOC of a Pacific Rim style Shatterdome. 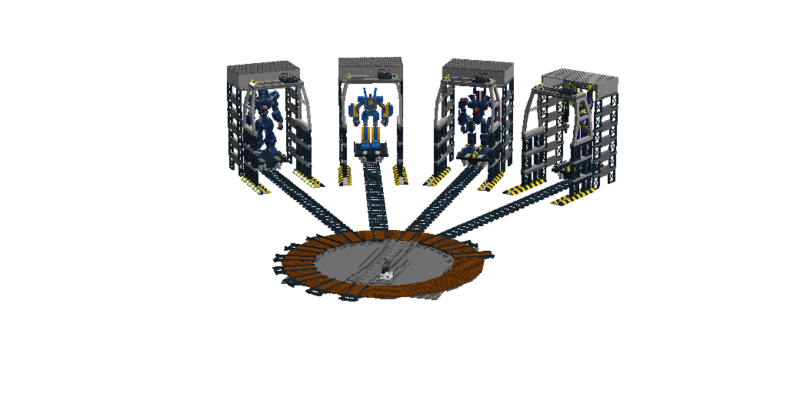 I plan to house each mech in it's own private holding pen/dock/bay, with each bay having it's own trolley leading to the center of launchpad which houses a central turntable. This turntable being used to redirect the mechs to where they need to go. Something important to note, the mechs are arranged, in their pens, around the turntable almost in a radial, floral pattern, with the turntable at the center, almost like a sunflower. The issue that I am facing is that I cannot come up with a design for said turntable. No matter what I try, I just can't get the turntable to integrate nicely with the mech sleds. As soon in the picture, there is also my attempt to create the turntable in question, but as you can see, it's not going as grand as I had hoped. 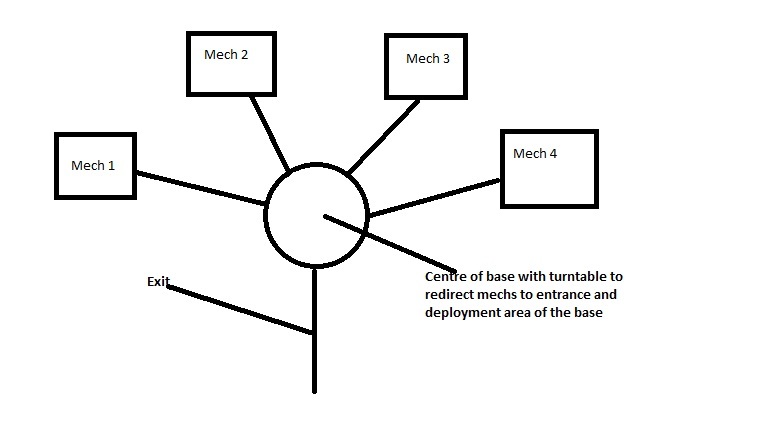 Based on your drawing and description, the closest analogy to your idea would be a railway turntable, where the mech bays would be akin to the roundhouse and the "exit" on your diagram represents the connecting railway to the turntable switching yard. LEGO models of such structures can be found and analysed for their various building techniques to see which ideas would suit your expectations and situation. Rails: yes or no? Obviously these models are designed with LEGO railway pieces in mind which might or might not be suitable for your MOC. Using the existing railway system offers a few advantages, like a complete ecosystem for straight and curved rails, wheels, carriages, switching points, couplings, etc. and might even look suitably industrial and heavy-duty. On the other hand their usage seriously limits the possible geometries (wheelbase length, minimal height of the carrier trolley, etc. ), defines the look of the model and might provide challenges with the connection of the turntable and the static rails. Another option would be to use carrier trolleys with rubber wheels on a tiled surface to get around some of the above restrictions. Implementation of the turntable itself The basic component is a circle-shaped, pit-like structure with a radius big enough to fit a carrier upon the rotating bridge above it and with enough depth to house the end supports, the central pivot column and the mechanism used to motorize it if needed. The central pivot and the end supports must be strong enough to hold the combined weight of a carrier and a mech on any point along the tracks on the turntable, which would mean either really sturdy supports or a carrier long enough to distribute its weight among multiple supports and the ground around the structure. The first two options require either a battery and control system built into the moving parts of the turntable itself, or wires that can feed the built-in motors from a static battery - but this option must be used with limiters or the wires might get tangled or snap. The third needs extensive gearing down to be able to handle the load and all losses without overstraining the motor. The last option avoids these problems but requires the turntable to be a complete ring with an interface suitable for propulsion (either a smooth circle that can be driven via friction from multiple rubber wheels, or a circular gear rack - The specialised parts from the Bucket Wheel Excavator or the 4481 Hailfire Droid wheels would be my first idea). So, I did some digging online for pictures to use as references for building this turntable I described above. By sheer luck, I stumbled across this post on LEGO Ideas for a discontinued idea for a Train Turntable MOC. The link can be found here. 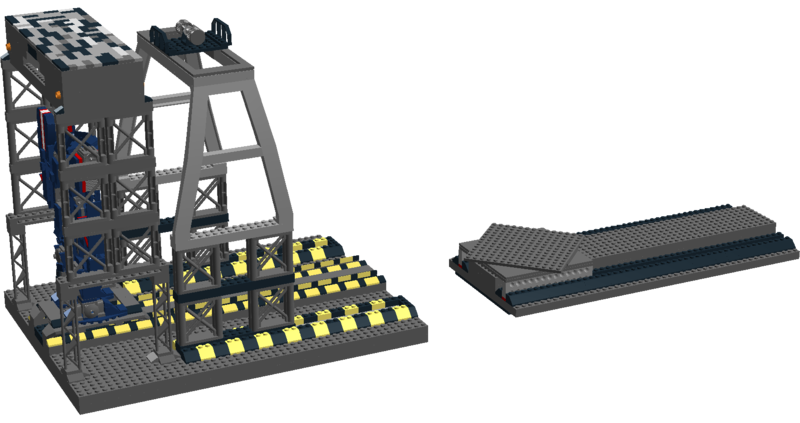 On this page, I managed to download the Turntable module itself, and dissected the model left, right and center to get an idea of what I wanted to do and accomplish in this massive MOC of mine. Essentially, the Turntable is a large long plate spinning on a central point, controlled by a gearing system that is used to rotate the assembly without actually touching the turntable itself. The Turntable itself is then surrounding by a radial pattern outfitted with rails, leading to the various mech bays I have surrounding the central turntable. Below is a picture of the turntable outfitted with a bunch of my mechs in their respective bays. Truth be told, the design is so blatantly simple, I'm surprised I didn't see it right in front of me in the first place. Not the answer you're looking for? Browse other questions tagged building ldd or ask your own question. How can I control the building instructions generated in LDD? Building a more-efficient water propeller?